Status: Draft document, unit complete and being tested in use. To the best of my knowledge, "Itchycoo Park" by the Small Faces was the first pop music track to make well controlled use of tape flanging as an electronic music effect circa 1967. So this modern but methodically authentic interpretation is named after that track. This is a 3U rack unit with standard mains power supply. It provides audio routing and speed control for two domestic three-head cassette tape machines such that they can be used to create authentic 1960s style tape flanging effects. 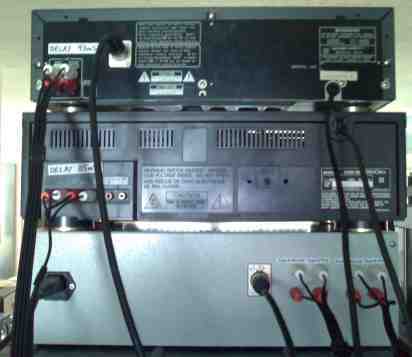 The tape machines link to the rear of the unit with a total of four dual phono leads. The speed control of one machine is achieved by voltage control of the capstan motor connected by a three wire connection. The flange effect can be adjusted manually on a front panel control or externally by voltage control. There are sufficient jack patch sockets and input-output flexibility such that the tape machines can also be used for tape echo or tape feedback effects. 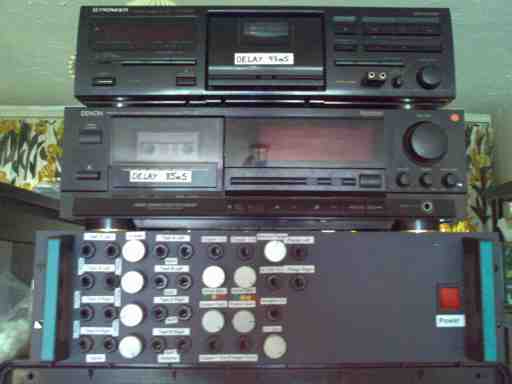 Inverting gain controls enable different tape decks to be used which may have an overall inverting signal path between the record inputs and the downstream tape monitor outputs. All inputs are daisy chained so that connection to 1 feeds 2, 3 and 4 before insertion of another jack. This allows easy use of most effects in stereo by connecting the second input channel to input 3. Illuminated side-showing centre zero moving coil speed indicator? Not fitted currently but may be added. The motor speed control may not be accurate enough at the zero position to bother. This sheet has standard regulators to provide regulated +/-5V reference rails and the motor speed control circuitry. Tape machine A in this prototype setup has a 12Vd.c. motor which has an internal electronic speed control, adjustable on a screwdriver control through a small hole in the rear. The motor has been set to its maximum speed on this control. The circuit here is provided with the 12V supply which would normally drive the motor with its internal regulation. This is reduced to a nominal *V which gives approximately the correct normal running speed. The speed regulator internal to the motor is thus running in drop-out, and speed regulation will not be particularly good. However this is not a major problem for a flanging effect where the speed is usually changing constantly. It should be considerably more controllable than the historic method of applying finger pressure to rotating tape spools. The external regulator is a traditional LM317, set to provide *V if the lower 1K resistor were to be grounded. The op-amp arrangement lifts this node to a higher voltage which is seen directly impressed on the voltage output. The op-amp input side sums with appropriate scaling the manual control voltage from the front panel pot with the external control voltage. An adjustment preset voltage is also summed in and sets the normal mid-point running speed. This sheet shows the main audio sections. The first four op-amps sum each dual audio input brought in on J5 and J11. This allows a source input and a feedback input to be summed easily. The summing amps provide buffering for the tape record inputs which are connected via J6 to phono sockets on the rear panel. The returns from the tape outputs enter on J7. They are sent to the CW ends of 22K linear pots on the front panels. In conjunction with amps U6A-D this forms a variable gain stage which can change the gain of the tape output signal by ±1.0. The tape outputs are sent to two split jack sockets each via J10. The splits allow the signal to be used as output and to be fed back to one of the input sums for echo. Two summing amplifiers sum the outputs from each of the variable and fixed speed tape decks to create two independent flange outputs. These are presented on two front panel jacks via J9. This sheet has the two clipping circuits which can be used to pre-clip feedback signals to limit actual tape overload. These can also be used externally for other effects. On clipper 1, a three LED level indicator shows green, yellow and red. Yellow is the clipping start point. Green is -6dB from clipping and red indicates +3.5dB from the clipping start point. A completely standard double-diode circuit is used. On clipper 2 a second knee is added to the circuit and there is a four LED indicator. Green indicates a signal -6dB from the first clipping point. When the first knee is reached the first yellow LED will light and there is a region of 3.5dB where the gain is reduced by 6dB. This is a region of soft clipping. When the second yellow LED lights the signal is +3.5dB from the soft clipping start and standard clipping begins. The red LED lights at +6dB from the start of soft clipping and is +2.5dB above the hard clipping point. Here there will be lots of lovely wiring showing internal connections between the main board and the equipment on the front and rear panels. Audio input is connected to Tape A left, jack 1. If stereo flanging is required the second channel is connected to Tape A right, jack 3. The internal daisy-chained input socket wiring automatically splits the signal inserted on jack 1 to jack 2. The same applies to jacks 3 and 4. The tape machines should be set up to give a reasonable recording level and about unity gain through the machine. All gain pots can be set to +1 initially and the manual flange control to its mid-point. When the machines are started, each flange output for left and right will be present on flange outputs 1 and 2, left and right. The familiar effect should be clearly audible when the manual flange control is rotated away from its centre setting. A deeper effect may be obtained by moving pots for tape machine B (or A) over to the -1 gain setting and adjusting for minimum output with the flange control dead centre. Sound of pseudo-random white noise after stereo tape flanging. Rapidly moving the flange control will create a pitch shift in the output signal proportional to the rate of change of the control. With the original and the pitch shifted signal being added together, this creates a chorus effect. Using an external oscillator to change the speed continually makes this quite practical, though the rate of change is limited by the mechanics of the tape transport. Mono audio is sent to input 1. As the inputs are chained, delayed audio will then be present on all tape outputs, and any tape output can be externally summed with the original input to create a single echo. Using tape A will allow a small variation of the delay time by adjusting the flange control. Example soundfiles to be added for each section. Mono audio is sent to input 1. 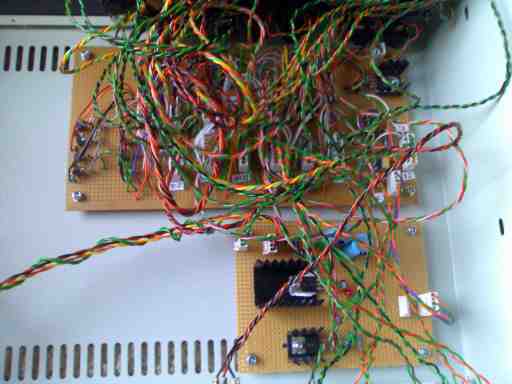 One of the tape 1 outputs is patched to input 2. Tape 2 output is patched to input 3 etc. The input signal and the four tape outputs can be summed externally and depending on appropriate setting of the gain pots and record levels it will be possible to have the initial input sound plus four distinct echoes. The four echoes can be made to die away or increase in level depending on the gain settings. Each echo will suffer another generation of cassette tape. Mono audio is sent to input 1. Any of the tape outputs can be patched back to its own respective input and gains adjusted to give a tape echo which dies away over time. 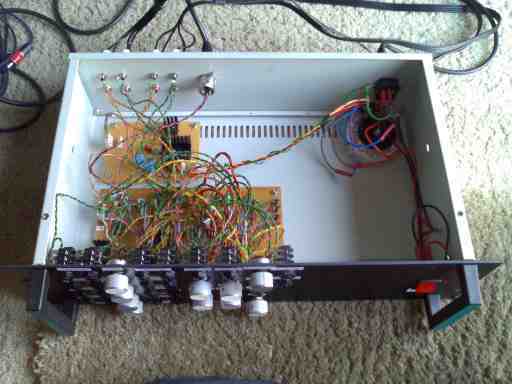 By patching output 4 back to input 1 a longer echo delay time with more cassette generations is possible. Mono audio is sent to input 1. Any of the tape outputs can be patched back to its respective input and gains adjusted to give a tape echo which increases until the tape saturates. The clipper circuits may be patched in to saturate the clippers rather than the tape. This might be useful for a slightly different sound. This is the kind of effect used in ancient times by the BBC Radiophonic Workshop to produce the eerie sounds from "The Quatermass Experiment"
Sum output for input 1 and all four tape outputs to ease the number of patches used for multiple echo.